The Bharatiya Janata Party (BJP) took a massive lead in Assam panchayat elections, counting of which is still underway amidst tight security. The counting began at 8 am on Wednesday and Thursday is the tentative day for the final results as the voting was done through paper ballots. CCTVs have been installed at counting centres. "The counting is going on peacefully. 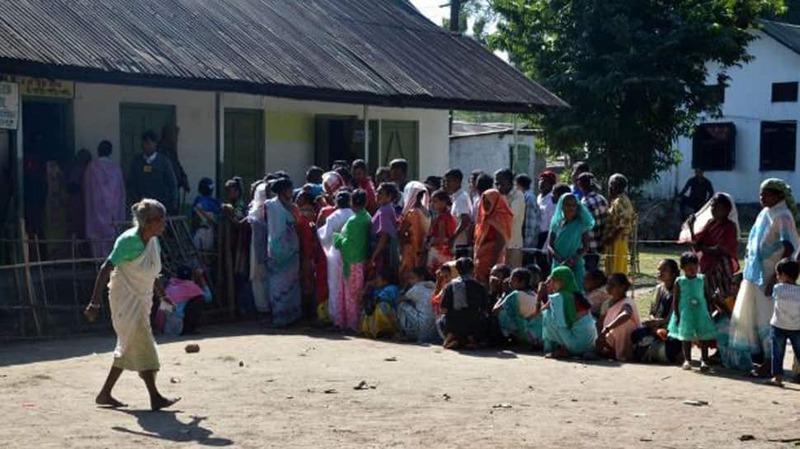 No anomalies have been reported from any counting hall in any part of the state," said Assam State Election Commissioner H N Bora. The first phase of the polls was held in 16 districts on December 5 and the second in 10 districts on December 9 to elect Zila Parishad members, Anchalik Panchayat members, Gram Panchayat Presidents and Gram Panchayat members. Overall 82 per cent polling was reported in the panchayat polls. Over 78,000 candidates are in the fray in the polls. The major parties that contested the elections include -- BJP, Congress, Bodoland Peoples Front (BPF), Asom Gana Parishad and All India United Democratic Front (AIUDF). The elections were held to elect 21,990 GPM, 2,199 GPP, 2,199 APM and 420 ZPM across the state. While there were 78,571 contestants, 734 were elected uncontested. For GPM polls, BJP's alliance partner Asom Gana Parishad (AGP) that contested alone won 1332, the All India United Democratic Front (AIUDF) 641 and others 430. For APM, AGP won 122, AIUDF 51 and others 30. For Zila Parishad Members (ZPM) election, BJP got 223, Congress 131. AGP won 37 seats, AIUDF 24 and others four for ZPM seats, the sources said. For GPP seats, AGP won 95, AIUDF 42 and others 43. The BJP has won 7,768 Gaon Panchayat Member (GPM) seats, 653 seats of the Anchalik Panchayat Members (APM), and 223 Zila Parishad Members (ZPM) seats. The party has also won 605 Gaon Panchayat president (GPP) seats. The Congress, in contrast, won 3,948 GPM seats, 365 APM seats, 131 ZPM seats and 293 GPP seats. The BJP has won 50 per cent more seats than the opposition Congress in the results declared so far in the Assam panchayat polls, State Election Commission sources said on Thursday. Addressing a press conference Assam State Election Commissioner H N Bora said the counting to all the 26,808 posts was likely to take entire Thursday. BJP has won the highest number of seats in the first day of the counting of panchayat polls in Assam Wednesday, with 45 per cent of declared results going in its favour, followed by the Congress, the state election commission said. Out of 2,199 Anchalik Panchayat Member (APM) seats, the BJP has won six seats while the Congress bagged one seat. The BJP also won two out of 2199 Gram Panchayat President seats. Counting of votes still underway. As per latest update, the BJP has won 481 out of 21,990 Gram Panchayat Member (GPM) seats. The Congress bagged 248 and Asom Gana Parishad (AGP) has managed 62. According to the latest trends, in Anchalik Parishad, BJP is leading in 102 seats, Congress in 55 seats, AGP in 11 seats, AIUDF in 7 seats and Others in 10 seats. The final results are likely to be available only by Thursday since polling was conducted using paper ballots. The counting for the polls is underway amid tight security and CCTVs have been installed in all the counting centres.